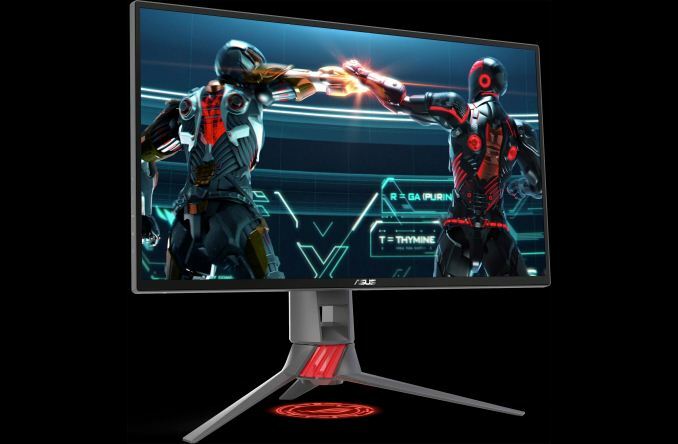 Hot on the heels of the Swift PG35VQ announcement, ASUS has unveiled three new Strix-branded gaming monitors that will feature AMD’s FreeSync technology. While the first Strix model was unveiled back at CES 2017 - the Strix XG27VQ - it was a one-off until the announcement of these newest models. 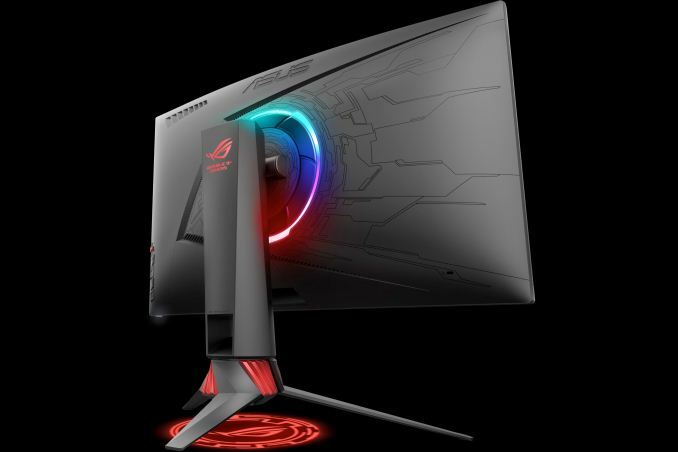 Clearly, ASUS intends to have a gaming monitor lineup that consists of both the Strix and Swift series. Starting off from largest to smallest, we have the Strix XG32V. This model has a 31.5-inch IPS panel with a WQHD resolution of 2560 × 1440 and an 1800R curve that should help provide a wider field of view. We don't have a ton of other technical details, we do know that this model can handle refresh rates of up to 144Hz and it supports FreeSync. It will be interesting to see what the actual FreeSync range actually is. For connectivity, there are two DisplayPort 1.2 inputs, one HDMI 2.0 input, and an undisclosed amount of USB 3.0 ports. Like on many of their other new gaming-oriented monitors, ASUS has added Aura Sync lighting to the XG32V. This not only means there will be an ROG logo that shines down onto the desk, but a back panel that features RGB LEDs and that can be synchronized with other Aura Sync-enabled PC components and peripherals. Moving on to the next monitor, the Strix XG27V is a more value-minded model that shares the 1800R curvature of the XG32GV, but shrinks the panel down to 27 inches and the resolution to 1920 x 1080. Thankfully, this model can handle refresh rates of up to 144Hz and it also supports FreeSync. While the XG27V has onboard Aura RGB lighting, it doesn't have Aura Sync, so it cannot synchronize with other Aura-compatible components and peripherals. Although specifics are lacking, connectivity is the form of a DisplayPort input, an HDMI input, and DVI-D port. While the Strix XG258 might be the smallest of the bunch, it has an ace up its sleeve. This 24.5-inch display features a 1920 x 1080, which is pretty conventional, but it supports a maximum refresh rate of up to 240Hz. According to ASUS, this means that the delay between new frames is just 4.2 ms, compared to 6.9 ms on a 144Hz gaming monitor. Much like the XG27V, this model has onboard Aura RGB lighting, but it doesn't have Aura Sync, so it cannot synchronize with other Aura-compatible components and peripherals. For connectivity, there are two DisplayPort 1.2 and two HDMI inputs, one of which is HDMI 2.0. Although we have no pricing details, all of these new Strix gaming monitors will be available starting in Q3.